Said to be the most important city centre development in the UK outside of London, the centre of Birmingham is set to be transformed into a vibrant, mixed-use development of commercial, civic, retail, leisure and hotel space, providing major improvements to pedestrian access and greatly enhanced public realm befitting this exemplary historic setting. Paradise will be one of the biggest development schemes Birmingham has seen for a generation and will dramatically transform this whole area of the city. Birmingham City Council approved two major new office buildings along with Grant Associates’ proposals for extensively refurbished public space in a project that will see central Birmingham transformed over the next few years. Grant Associates’ designs for enhancing the public realm include a series of new streets and public squares around the city centre’s historical listed buildings. The upgrading of this key public realm will be brought forward with over 354,000ft2 Net Internal Area (NIA) of speculative office and retail space in the first two new buildings on the site. One Chamberlain Square, designed by Eric Parry Architects, provides 172,000ft2 NIA of Grade A office space over seven storeys, including retail. 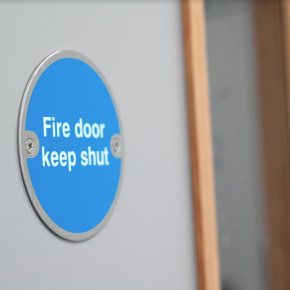 The office entrance will be on Centenary Way, with restaurant or leisure uses on the ground floor and frontage onto Centenary Way, Congreve Street and Chamberlain Square. 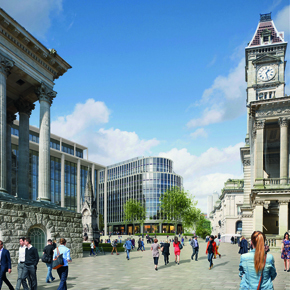 Construction work on One Chamberlain Square is expected to start in spring 2016. Designed by Glenn Howells Architects, Two Chamberlain Square provides a further 182,000ft2 NIA of Grade A office space, which fronts onto Chamberlain Square, with the ground and upper ground levels offering space for leisure and retail uses. Work on site is due to start in the autumn of 2016. 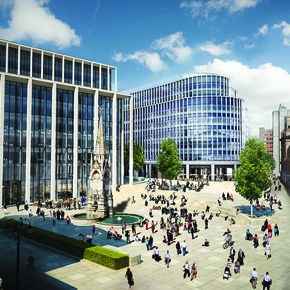 Both buildings overlook Chamberlain Square, which will be completely reconfigured by Grant Associates to enhance this central public space. 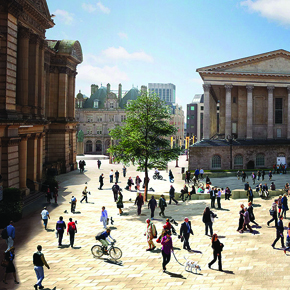 The design concept includes a new, wide pedestrian street through the development that links the upgraded Chamberlain Square to Centenary Square and will be constructed at the same time as two new buildings. 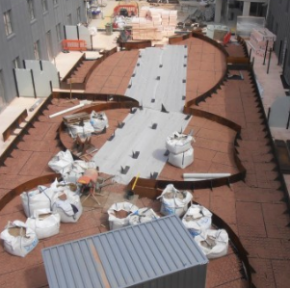 The provision of high quality public realm, greatly enhancing the setting of Birmingham’s most important historic buildings, is central to the Paradise development. The buildings and public space are being designed to create a vibrant street scene around the pedestrian streets and squares. The high quality venues will provide restaurants, cafés and shops that reflect the contemporary working environments being created in the new buildings. The 1,500,000ft2 project is part of the wider £500m masterplan by Glenn Howells Architects. 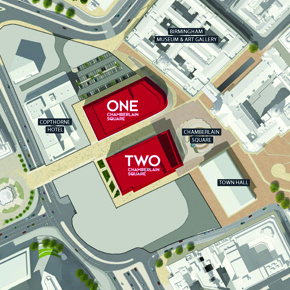 The Paradise Birmingham redevelopment is being brought forward through Paradise Circus Limited Partnership (PCLP), a private-public joint venture with Birmingham City Council, with the private sector funding being managed by Hermes Investment Management with Argent acting as development manager. The enabling and infrastructure works, currently underway, have been funded through an approved £61m investment by Greater Birmingham and Solihull Local Enterprise Partnership (GBSLEP). The city centre will also see further investment in its public space with the revamp of Centenary Square in a separate scheme for Birmingham City Council designed by Graeme Massie Architects. 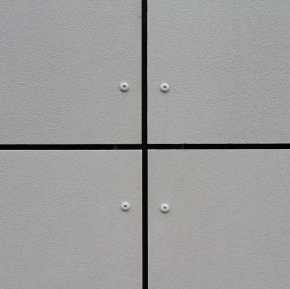 Seamlessly integrating contemporary new office buildings, retail and leisure spaces and high quality public realm with Birmingham’s most historic squares and buildings, Paradise is place-making at its very best.